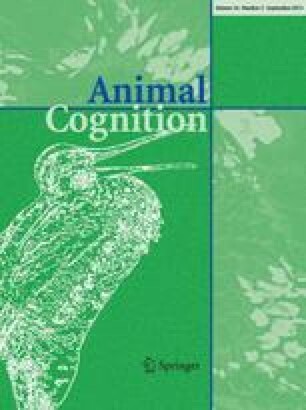 Various experiments revealed that if an animal learns a stimulus–response–reinforcer relationship in one context and is then tested in another context there is usually a lessening of stimulus control, and the same discriminative stimuli that reliably controlled the behavior in the first context will have less effect in the new context. This reduction in performance is known as the “context shift effect.” The effect of changing context on the probability of detecting explosives was investigated in seven highly trained explosives detection dogs (EDDs). In experiment 1 the dogs were trained alternately on path A, which always had five hidden explosives, and on a very similar path B, which never had any explosives. Within a few sessions the dogs showed a significant decrease in search behavior on path B, but not on path A. In experiment 2 the same dogs were trained only on path B with a target density of one explosive hidden every 4th day. The probability of the dogs now detecting the explosive was found to be significantly lower than in experiment 1. In experiment 3 the effect of the low target density as used in experiment 2 was investigated on a new but very similar path C. Both the detection probability for the one explosive every 4th day on the new path and the motivation to search were significantly higher than found in experiment 2. Finally, in experiment 4, an attempt was made to recondition the dogs to search on path B. Although trained for 12 daily sessions with one explosive hidden every session, the dogs failed to regain the normal levels of motivation they had shown on both new paths and on the paths that they knew usually contained explosives. The findings reveal that even a very intensively trained EDD will rapidly learn that a specific stretch of path does not contain explosives. The dog will then be less motivated to search and will miss newly placed targets. This learning is specific to the formerly always-clean path and is to some extent irreversible. However, the dog will search and detect normally on new paths even if they are very similar to the always-clean path. The data are discussed in terms of variables affecting renewal. The results suggest that following training designed to make a behavior “context independent,” any extinction training will not generalize beyond that specific context used during the extinction training. In addition, if the behavior is extinguished in a specific context, it will be very difficult to restore that behavior in that context. These conclusions should be considered by anyone attempting to extinguish well-established trans-context behaviors. This research reports portions of a doctoral dissertation submitted by Irit Gazit to Tel Aviv University. We gratefully acknowledge Dr. A. Terkel and Ms. N. Paz for help in preparation and editing of the manuscript, and Ms. I. Gunther and Ms. N. Gazit for help with data analysis. We also thank the dog trainers, handlers, and dogs themselves for participating in this study.